Regardless of the recent changes to the law, Social Security planning is still a critical component of any retiree’s financial plan. Social Security remains a rare asset. It lasts as long as the retiree does, and it keeps up with inflation. It makes sense for retirees, unless for some reason they have a shorter life expectancy, to delay benefits as long as possible and maximize the monthly checks they’ll receive for life (and perhaps the life of spouses collecting survivor benefits). These rules will still hold true even if your client is affected by the recent law changes. For many individuals, the new law will decrease the total Social Security benefits they’ll collect over their lifetimes. But there are still effective strategies. 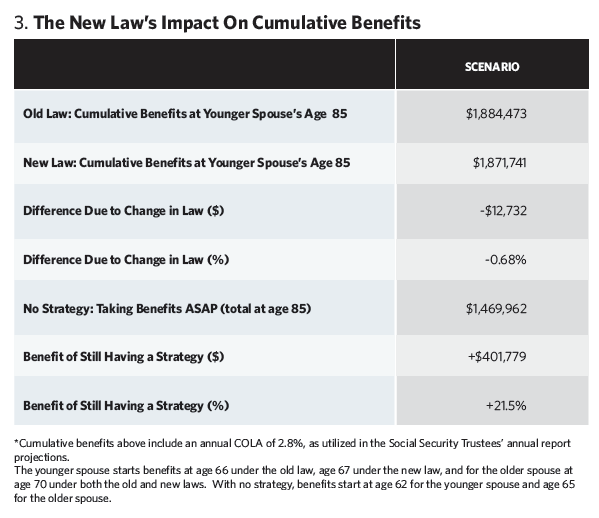 Table 2 depicts a scenario involving a married couple—part of the group most affected by the recent law change—and compares collection strategies under both the old and new Social Security laws. Under the new law, Spouse 1 in this scenario can no longer collect spousal benefits until Spouse 2 has begun receiving his or her own benefit. This delays spousal benefits by one year, but a similar strategy can still be implemented to optimize the couple’s overall draw. How much in benefits will the couple receive under the new law, as compared with the old law? The cumulative benefits in Table 3 include an annual COLA of 2.8%, as utilized in the Social Security Trustees’ annual report projections. The younger spouse starts benefits at age 66 under the old law and age 67 under the new law, while the older spouse starts at age 70 under both the old and new laws. With no strategy, the benefits start at age 62 for the younger spouse and age 65 for the older spouse. As you can see from the table, the recent law will decrease cumulative Social Security benefits by a relatively small percentage. But it’s more important to note that choosing a proper filing strategy can still make a significant financial difference. The new law provides a relatively minimal change to Social Security’s long-term fiscal health. Bigger changes are needed to avoid an approximate 20% across-the-board reduction in benefits in 2034, when the trust fund is expected to be depleted. • An increase in the full retirement age of future beneficiaries. • A reduction in benefits for younger generations. • A decrease in the annual cost-of-living adjustment. • An increase in payroll taxes or the taxability of benefits. Most of these proposals would likely affect beneficiaries younger than age 55. Also, it’s important to be realistic about a time line for major changes to the system. The changes taking place this year are relatively small and therefore can be implemented more quickly than the larger changes that are likely to come. To put this in historical perspective, in 1983 Congress passed a law to gradually increase the retirement age from 65 to 67, beginning in year 2000. We are still seeing this change being implemented today, nearly 33 years after the law was signed! This will continue until 2022, when those born in 1960 will turn 62 and become the first group to have a full retirement age of 67. In a similar fashion, significant changes to Social Security going forward would likely be phased in over long periods of time so future generations could plan ahead for adjustments. This means that larger changes to the Social Security system would not be likely to impact current retirees. Anyone nearing retirement age right now should not let fear of future reforms thwart their Social Security planning strategies. If your clients are affected by the new law, remind them that it doesn’t negate the power of Social Security as a longevity hedge. Also, it’s still paramount to their financial security that they have an efficient strategy for collecting benefits. Finally, we always suggest to clients that Social Security claiming strategies should be highly customized according to their particular situation. Encourage your clients to discuss with you how the new law affects them and whether they’ll need to take any action before April 30, 2016, to earn their highest benefit. Amanda Lott is a partner and wealth advisor at RegentAtlantic Capital LLC.